The Optoma ML750ST certainly outclasses most other mini-projectors on sheer power alone, as well as the multitude of media ports and display options, but the lack of out-of-the-box wireless connections and uninspired physical design holds it back from top honors. While projectors can come in a variety of shapes and sizes, like any piece of technology it’s what’s under the hood that counts. The Optoma ML750ST isn’t terribly attractive, but it is an absolute workhorse packed into a relatively small frame, outputting 700 ANSI Lumens with an astonishing 20,000:1 contrast ratio. When you need professional presentations from a projector that won’t take up much space, the Optoma ML750ST absolutely delivers a high-quality picture with minimal fuss. The molded white plastic square box isn’t going to win any aesthetic awards, resembling a small, hand-sized box with a cylindrical focus lens shoved into one side. The device measures 4.4 x 4.8 x 2.2 inches, accounting for the lens sticking out a solid inch in the front, and is amazingly lightweight at just under one pound. A rubber lens cap is provided to protect the exposed lens when not in use, and attaches to the device with a cord. The top of the device sports several raised plastic buttons, including the power button, four directional buttons, an Enter button, a Menu button, and a Media Source button. The buttons make a harsh clicking sound when pressed, making the device look and feel cheaper and older than it is. As a short-throw projector (0.8:1) the Optoma excels at producing a large image without having to pull the projector too far away. Every side of the projector features vents and fans. The rear includes the tiny speaker and all the important ports: USB, HDMI/MHL, micro SD, 3.5mm audio jack, DC power jack, and Optoma’s unique Universal I/O, which connects to VGA with the supplied cable. The bottom includes a standard threaded hole for mounting on a tripod (sold separately), and three rubber feet. The front foot can be unscrewed to slightly raise the front of the projector without the need of a tripod. Opening the cardboard carton reveals the Optoma’s zippered nylon carrying case, tucked snugly inside an eco-friendly Inflatable Packaging AirBag. All of the Optoma’s components are neatly arranged in their proper compartments within the case, which includes a small IR remote control, the power cable, and an Optoma Universal to VGA cable. The projector takes up about two-thirds of the carrying case. Every piece fits neatly inside the case thanks to velcro nylon pieces that create subsections. Unfortunately, the case lacks a hard shell, meaning there’s nothing to stop it from being crushed by other items in a suitcase or taking damage from a big fall. The only physical documentation is a visual guide showcasing the various connections. The full 50-page PDF user manual is located in the device’s internal storage via the Office viewer. Reading a digital manual by scrolling through it on the projector itself is a needless hassle. Setting up the device is as simple as plugging in the power cable, followed by the video source into the appropriate port. The projector will automatically detect and load the proper source, or you can manually switch between HDMI, VGA, and Media storage. The only included video cable is a unique cable designed for Optoma projectors, utilizing the 24pin Universal I/O port. The other end is a VGA connector that fits into any laptop or PC. You can also use a standard USB cable or HDMI cable, sold separately. Wireless and smartphone connectivity is much more of a hassle, however. While the projector has Optoma’s integrated HDCast Pro for wireless connectivity, you’ll need the Optoma wireless dongle to connect your phone or tablet, or use a third party HDMI converter, which we weren’t able to test. We would have vastly preferred a simpler, straightforward Bluetooth connection, especially at this price. With 700 ANSI Lumens and 20,000:1 contrast ratio, we were very satisfied by the vivid picture and vibrant colors, even in dimly lit rooms. DLP image technology ensures low latency between the source and the projected image - useful for using the Optoma ML750ST for gaming after a stellar presentation. The Optoma has a native resolution of 1280x800 and 16:10 widescreen but supports up to 1680x1050 (VGA) and 1920x1080 (HDMI), along with 16:9 widescreen and 4:3 standard. Several image modes can be quickly switched between via the menu or the picture button on both the remote and the device itself: PC, Cinema, Bright, Eco, and Photo. Bright and Eco determine the extreme ends of the lighting, with the latter drawing far less power and reducing fan noise almost completely, and Photo provides rich color saturation that pairs well with animated movies. The Optoma ML750ST also supports 3D movies, though we were unable to test it. While the picture quality is impressive and full of options, the sound quality was clearly an afterthought. As a short-throw projector (0.8:1) the Optoma excels at producing a large image without having to pull the projector too far away - useful in cramped offices or small rooms. At a mere three feet (36 inches) from the wall, we got an image of 54 inches, while at six feet (72 inches) we enjoyed a luxurious, clear screen size of 100 inches. The Optoma ML750ST officially supports screen sizes up to 135 inches. Like most modern projectors, the Optoma also includes an auto Keystone correction to keep the projected image at the proper viewing angle. While the picture quality is impressive and full of options, the sound quality was clearly an afterthought. A single 1.5-watt speaker is located in the rear of the projector. The sound is as tinny and small as you’d expect. Thankfully a 3.5mm audio jack is provided to connect external speakers using a standard speaker cable. By connecting to a Bose external speaker, we were able to greatly increase the sound quality to match the excellent picture quality. For watching movies on the Optoma ML750ST, using an external speaker is all but a requirement. For USB, HDMI, and VGA, the projector instantly accepts and loads whatever port is in use, supporting up to 1080p resolution and displaying gaming consoles, laptops, and Blu-ray players, though you’ll need to provide your own cables. You can have multiple devices plugged in and switch between them using the media source button on the remote or via the menu. The Optoma lacks an operating system but does include an internal media player for playing media directly inserted into the device, including a USB flash drive and a micro SD card. Accessing the files was quick and easy, and separate lists are provided for photos, videos, music, and documents. Most commonly used file types are supported, though we were surprised that PNG was not supported for pictures, nor FLV for video. The Office Viewer supports Microsoft Word, Microsoft Excel, and MS Powerpoint, and scrolling is a snap with the remote control. Though it doesn’t have an internal battery, the Optoma ML750ST is designed and marketed as a highly portable mini-projector due to its compact size. Optoma is a major global brand for both professional and high-end consumer projectors and audio equipment. Its steep price tag of $550 puts it near the top end of mini-projectors, and it’s disappointing that Optoma does not at least include an HDMI cable. The Optoma ML750ST is a solid compromise between the power of a full projector and the portability and size of a mini-projector. 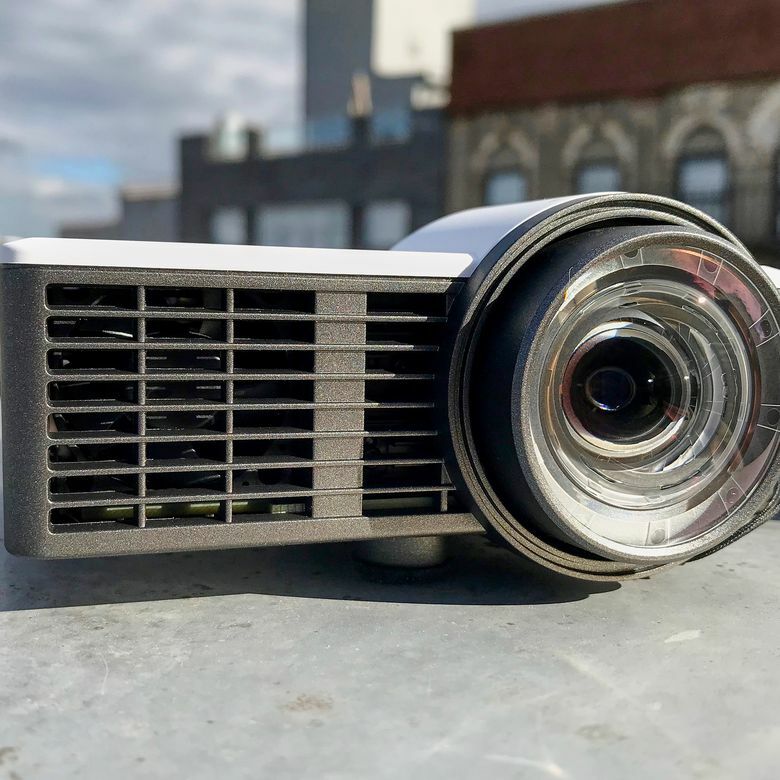 Optoma’s mini-projector puts it in a unique place between portable projectors, which typically range from $100-$400, and full projectors that start costing thousands. Its closest competitors include the AAXA P300 Pico Projector at $359 and the Anker Nebula Mars II at $499, both which feature rechargeable batteries at the cost of fewer lumens. For even more power, and a rechargeable battery, look at the AAXA M6 LED Projector, which features 1200 lumens with an MSRP of $639. Interested in reading more reviews? Take a look at our selection of the best mini projectors. A portable and powerful projector that's ideal for the office. The Optoma ML750ST is clearly designed with professional office presentations in mind, and its small form and travel case make it the perfect choice for business travel. However, anyone can benefit from a powerful projector that doesn’t take up a lot of space, though cinephiles and TV-replacers will want to invest in external speakers.